A: Pours a hazy dark burnt orange in color with moderate amounts of active visible carbonation rising from the bottom of the glass and slightly heavier than moderate amount of copper colored highlights. The beer has a two finger tall dense creamy foamy light beige head that slowly reduces to a medium to large sized patch of medium thick film surrounded by a large patch of very thin film covering the remainder of the surface of the beer and a thin ring at the edges of the glass. Significant amounts of lacing are observed. S: Moderate aromas of citrus/grapefruit pith, floral, and pine/resin hops over the top of just shy of moderate aromas of caramel + toasted malts with a moderate amount of sweetness. T: Upfront there is a slightly heavier than moderate flavor of caramel + toasted malts with a just shy of moderate amounts of caramel sweetness. That is followed by moderate to strong flavors of citrus/grapefruit pith, floral, and pine/resin hops which impart a moderate to heavy amount of lingering bitterness. M: Slightly heavier than medium bodied with moderate amounts of carbonation. Light amounts of dryness and moderate amounts of alcohol warming in the finish. O: This is a big beer with big amounts of hoppy bitterness but the alcohol is well hidden from the smell + taste. Enjoyable old school style DIPA with a good balance of malty sweetness and hoppy bitterness. This beer pours a deep amber, almost copper, in color. It is topped with an inch of tan head that leaves decent lacing. The aroma is malty and has tea and floral smells. This is not what I expect from an IPA. The taste begins with toasted malt. A stale bitterness creeps in and lingers in the finish. This has all the elements of an old IPA, but it was new to my bottle shop's shelves. 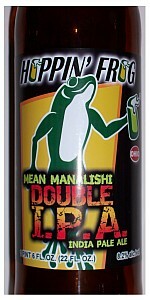 I have been disappointed in Hoppin' Frog's IPA's in bottles, aside from Killa Vanilla. I think I am officially done wasting money on their overpriced bottles of any IPA. Poured from a 22-oz bottle into pint glass in April 2017. I did not see any bottled/drink by dates on the bottle, but I drank less than 1 month after purchase. Appearance: Deep amber body with huge light-tan head. Beer is clear and not cloudy. Head is thick, and leaves a lot of lacing on the glass. Smell: Aroma apparent as soon the cop was removed. The aromas filled the room when poring into the pint glass. Beer contains a strong hops aroma, and includes also some grapefruit, pepper, and pine smells. Definitely dominated by the hops aroma. Taste: There is a very strong hops flavor, as expected from a double IPA. There is a strong bite from the hops along with other flavors like citrus, but the hops bitterness does dominate. There is a little sweetness from the malts. The aftertaste provides a nice variety of flavors over time. This is a strong IPA, and since the flavor is dominated by the hops, would be best appreciated by those who like hops dominated beers. Mouthfeel: Medium bodied. Medium alcohol, which matches the 8.2% posted. Very crisp mouthfeel. This is a hoppy medium-bodied beer, that is smooth to drink. It is an interesting Double IPA. The aftertaste is really enjoyable. I found the IBU rating of 168 on the bottle interesting, but most sources that I checked with state an IBU beyond 100 or 120 is not perceivable. The stouts from Hoppin' Frog Brewery are some of my favorite stouts, and I had hoped the same for this. It is good, but not as outstanding as the other Hoppin' Frog beers. From the 22 oz bomber in a snifter via a friend from work---Thanks Kevin! malt is enough to keep it drinkable and enjoyable. L: Dark orange w/ some cloudiness. S: Sweet malts, some hops and juicy grapefruit. T: The malt presence really subdues everything else. Not too much hops or hop bitterness, especially considering they're claiming 168 IBU's on the bottle. Some alcohol on the backend. O: Curious if my bottle had some age on it or what, but this is maltier than I expected. I was expecting the bitterness to be in my face but wasn't the case at all. Worth a try if you enjoy IPA's on the malty side... but nothing too impressive. Copper to dark copper appearance, lots of sediment/yeast floaties in it. Aroma dropped lots of grapefruit like bitterness. Here comes the bitter. That's the takeaway from the beer, totally unfiltered and bitter without much in the way of flavor beyond that from the hops. The malt is kinda weird too, seemingly dark/roasty for style, then it drops some tree bark like notes. Somewhat unique points for that. Once your palate fatigue sets in, you get a little more acclimated to this one. This beer pours a rich amber with an average head. The aroma is not particularly vibrant, composed of some caramel, pine, mango, and orange peel. The flavor is excellently bitter, with lots of pine, resin, orange peel, grapefruit peel, mango, pineapple, guava, passionfruit and a hint of caramel. The bitterness is very prominent, in a good way. The mouthfeel is medium bodied, with a very dry finish. Overall this is a beer I very much enjoy. Often double IPAs are too sweet for my palate, but this works very well - the hgih bitterness blansk out any sweetness, leaving just a touch of caramel richness. Copper orange with a large eggshell colored head. Stinky, dank, and pungent cat pee comes off the nose with some overripe peach and orange rind trying to bring it back into the culinary realm. There are maybe some supporting toffee notes, but hops dominate, taking no prisoners with burnt pine resin and a touch of grapefruit candy far in the background. Powerfully bitter and dry, Mean Manalishi is taking the West coast style IPA to the extreme. Great IPA, very strong, but great balance!